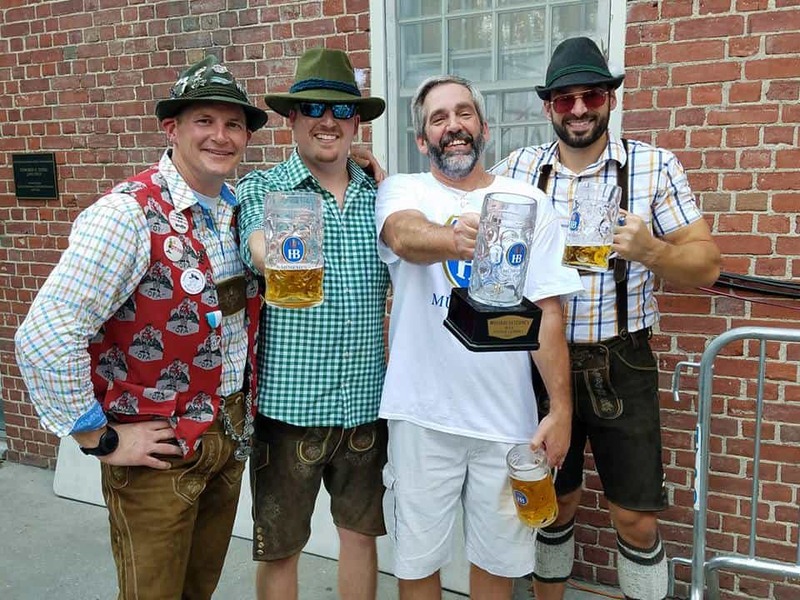 Now that we're just about 3 months away from the Oktoberfest in Central Park and Steuben Day Parade, we wanted to check in with Mike Ayling, the 2017 Hofbrau Masskrugstemmen Men's National Champ and current U.S. record holder with an unbelievable time of 21 minutes and 5 seconds. Mike shared his steinholding story with Jim, along with some training tips and what he has planned for the future. You can also check out video of Mike's win and also our interview with him from right after his victory. Jason Hurta, 2014 US National Champion and National Championship Judge/MC, Deryk Lindsey, 2016 US National Champion, Mike Ayling, 2017 US National Champion, Jim Banko, 2015 US National Champion, National Championship Judge and US Steinholding Association Founder. Photo courtesy of Texas Steinholding. USSA: What was your first competition and how did you get into steinholding? Mike: It was interesting, my first experience was at our German club, The Phoenix Sports Club. The first time I competed was at the club. 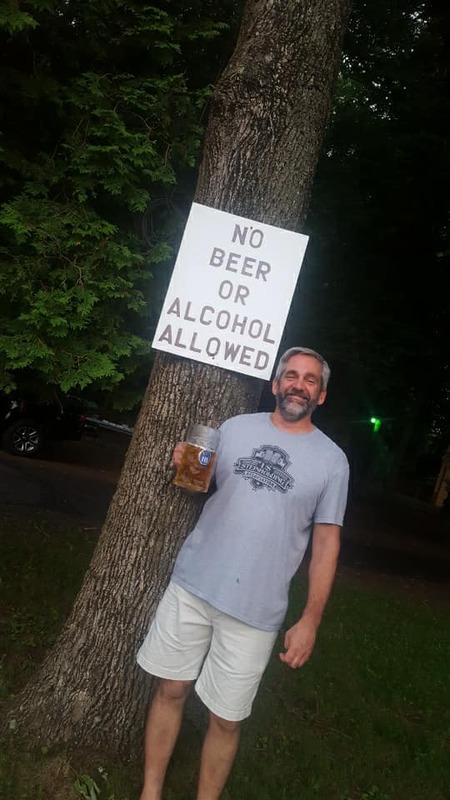 We were thinking about doing it and we were messing around at the house at my son's graduation party and we picked up some steins and tried it out and I was able to go longer than anybody. So I figured I'd give it a shot. There was an entry fee to enter the competition at our club but you got a shirt and a stein and beer, so even if you don't even hold it you're ahead of the game. So I competed at the club and won and actually, I've only officially held a stein 3 times: once at the club to qualify, then at the regional qualifier against some of the other local Philly-area clubs and then up in New York at the national championship. USSA: Well you didn't ever lose, so you didn't need to waste any effort going back year after year like I did. It sounds like you've still got the spark though- are you thinking about competing some more? Do you have any plans to get back in the ring? Mike: Yes I am. I'm thinking about getting back into my training soon. Brauhaus Schmitz in Philadelphia has a competition with some pretty nice prize money and I'm thinking of going after the Sam Adams competition as well. There are a bunch of places near me that are having competitions. I've been watching videos of competitions online and I really get a kick out of it. It's weird to watch now and knowing what they're going through. People think it's easy at first and then they realize how hard it gets pretty fast. USSA: Everyone can do it longer than they think, or at least longer than they want to. That's a big part of the training is making yourself tough mentally and practice fighting through that pain as well as physically building up your stamina. 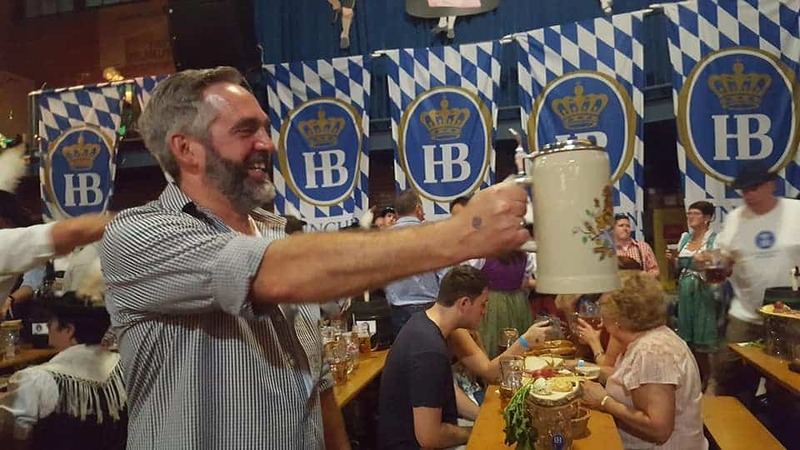 Another thing that I've been talking to people about is trying to figure out how long a human is capable of holding a stein. Like the top end of peak physical ability. 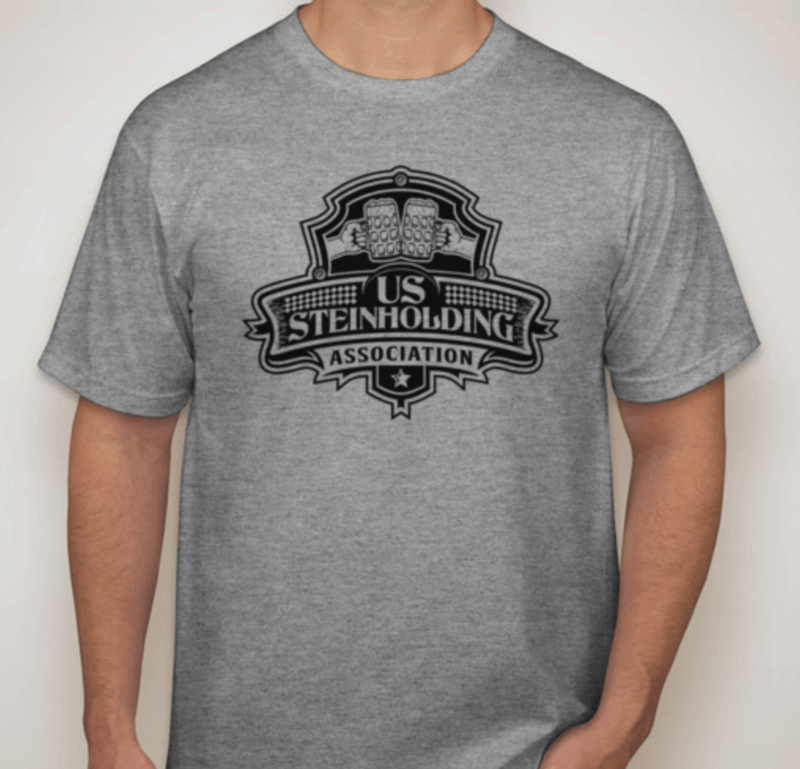 What do you think we're capable of as a species for steinholding? Mike: You know, I don't know. It's gotta go higher than what I did for sure though. I wasn't as dedicated in my training as I could have been, I wasn't training every day and I only started training in late June, so I only really had July and August. USSA: You've gotta have some really special steinholding genetics or something. You're absolutely a natural. It took me five years to get the training right and work my way up to 17 minutes. In two months you got up over 21 minutes. That doesn't make me feel great about myself haha. Mike: Yeah you know, it's one of those things. When I first tried it at the club, I went 9:24. USSA: The first time you ever tried it, without training you almost went 10 minutes. That's really impressive. Yeah you're a natural steinholder. And when I say you're a natural, I don't mean to in any way diminish the effort you put in because I know you worked hard for it, but like holy crap. Mike: I didn't really have an idea of what to expect or what to aim for really until I went out and did some searching and found ussteinholding.com and learned about the training and looking at the different times that had been posted. I was seeing where people fell in the standings and figured if I could go about 10 minutes I would at least be respectable. Even with the training, I still don't know how I went as long as I did. Training yourself to get past it mentally is the biggest thing like you said. As far as how long can somebody do it, you know if you get somebody like a physical trainer or somebody like that who really knows what they're doing, somebody can definitely go longer than what I did. USSA: That's something I've been thinking about for a couple of years. Right now there aren't that many people who know about the sport so it's kind of flying under the radar. But if you find somebody who's a World's Strongest Man competitor or a bodybuilder or pro football player or somebody like that who really knows what it's like to push yourself like crazy in training every day they probably have the strength and discipline and mental toughness to come in and clean up. Julie made a good point about Cross-fit athletes and how they could probably do really well too, but you don't see them hanging around at the beer tents. The sport is getting bigger, which is great, but I think eventually you'll see more pro athletes getting into it. Right now it's a lot of people who honestly just end up being in the right place at the right time when a bar or festival or club like yours is having a competition and then they see that they've got a shot at it and bust their asses to make it happen. Eventually, I think it will get a lot more competitive as we get closer to that upper limit of what the human form is capable of and also as more serious athletes get into it. Mike: If you continue to push it and keep making it successful, you could push it right out of the reach of the beer tent guys. USSA: Yeah that's also something that I've been thinking about as we've been promoting the sport. But you're right, as it becomes more competitive, it also becomes less accessible in some ways. At least at the national level. But there will always be local competitions where anybody who happened to show up just to drink a beer has a shot at winning. But the last couple of years have definitely surprised me. I was surprised when Deryk beat my record and then I was surprised again when you beat his this past year. Do you think someone will break your record this September? Mike: I was surprised too (laughs). Well that's a tougher question. You just never know who's out there doing what. In a way it gets easier each year because there's a new mark to shoot for when you're training. USSA: That's a good point: having a specific goal to aim for definitely makes it easier in a way. Now that you've had some time to return home victorious and enjoy being a national champion, have you been recognized as a hero in your community at home? Mike: Yeah kind of. My picture is up at our club. At the Philadelphia Steuben Parade, the Phoenix Club has a float in the parade and I got to stand on the trailer and wave to people in the parade. We went right past The Austrian Village on the float and the guy that I beat at the regional competition who came from The Austrian Village was there and he gave me a salute and after the parade he bought me a beer when we were on our way back, so that was nice. At the end of the parade, there's another German bar that we went to and one of the committee members from the parade was there and wanted to take a picture with me and the queen of the parade was there so we took a picture too. Then at the Brauhaus Schmitz, they've been having competitions at their Oktoberfest at the Armory. The S&H Premium Brands guy got our club some tickets to that, so we went to that with some family and some of our friends from the club, and I got to be the honorary keg tapper for the opening keg of the festival, so that was pretty neat. They also gave me one of the fancy steins with the covered lids. So it was some small local stuff, but it was cool. USSA: Well there are definitely perks to being a national champion. It's always nice to hear when a steinholder gets some recognition. You worked hard for it. Do you have any apprentices at your club that you're grooming to be a future Champion? Mike: Not really anybody I'm directly standing over, but my son-in-law has been training a little bit over here at the house. I've been trying to show him some things, a lot of it I picked up from your site from your training instructions. USSA: How much of your training regimen are you willing to share? Mike: I really used a lot of what you have on ussteinholding.com. There's not much to add to it really. I did some work practicing with dumbbells. I started with 5 pounds, but that wasn't doing much for me so I moved up pretty quickly. We have some 10s, 15s, and maybe 25s, but I didn't do a lot with those, so it was mostly 15s. USSA: Were you doing practice or training holds for time or were you doing weight training type exercises with the dumbbells? Mike: I was doing some things where I'd hold the dumbbell out straight and move in and out from the front to the sides and back with my arms straight, like some of the exercises you talk about on the website for stabilizing muscles. I was also pushing myself to see how long I could go with the heavier dumbbells as well. The other thing I was using was an exercise band. I would stand on the loop end and hold the handles in my hands and hold those up in front and do circles. I figured the higher I went, the more tension I'd be putting on the shoulders since if you hold a dumbbell up at a certain height level it starts to take the tension off of the shoulder. I almost took an eye out once when it came out from under my feet (laughs). It wasn't every night that I'd train with a full stein but when I would, I would do training holds with holding it as long as I could and then taking a short break and I think that made a big difference with my times and my recovery. The first night I did the competition at the club after going the nine minutes, I couldn't even pick my arm up to shake hands but I could see myself getting stronger as I'd do the practice holds. Mostly that was the extent of my training. I did some other things here and there just to do some workouts for other body parts. But for the steinholding training the big things were straight arm dumbbell exercises where I'd move my arms around more and using the exercise bands. USSA: The results definitely speak for themselves and we'll be adding some of your tips to the training guide. You made incredible improvements in your time over just a couple of months, so I'm sure it will be helpful for other people to hear about your techniques. 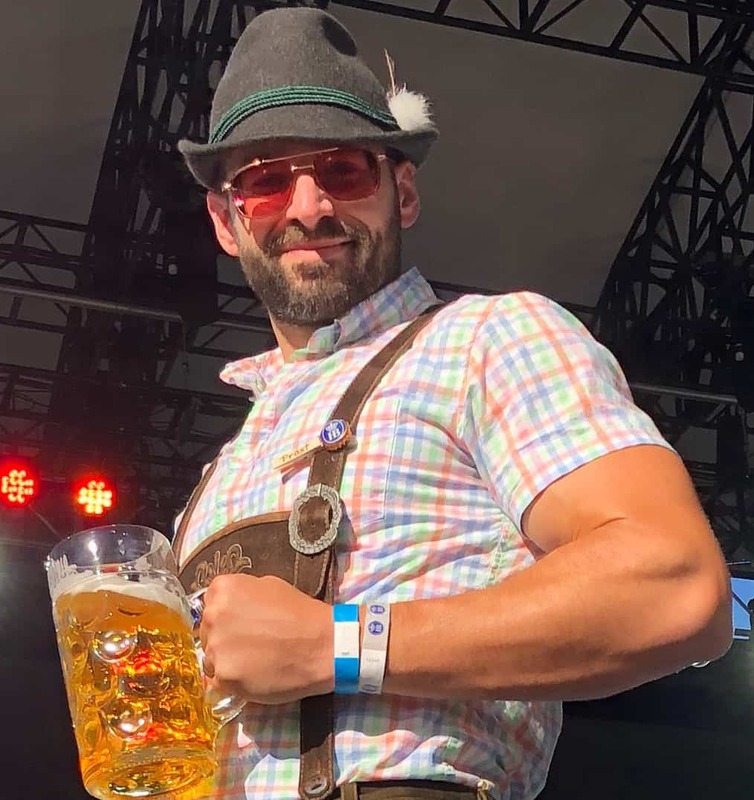 I've been referring to you as the "Clark Kent of Steinholding" because you don't have a big barrel-chested typical strong-man type build, but you're obviously very well suited to steinholding because you picked up that stein and blew everybody's mind. And you only trained for two months! Mike: Yeah, well I don't know how all that happened. I've joked with people that I did so well because I don't have much mass in my arms, so I didn't have as much to hold up as everybody else. Having shorter arms than some of the taller guys helped too. If you think about it, it makes a big difference. USSA: And determination makes the biggest difference really. Having the toughness to keep doing this type of training even for a couple of months is no easy thing to do. Other than winning the national title and setting the new US record, what were some of the highlights of your trip to the finals in NYC? Mike: I had never really gone and spent time in New York before. Going to Bierhaus NYC and meeting the other competitors on Friday night was really neat. I look forward to doing that again this year and enjoying myself a little since I won't be so nervous about the competition this time. After that we went to a piano bar that was nearby and they had a dueling pianos thing. Then the Oktoberfest itself was a really fun time. I was very nervous and I didn't even sit in the Hofbrau VIP tent. I just bought myself a beer and walked around for a little bit before the competition. Then that night after the festival we walked around Central Park and there were some cops that stopped me and wanted to take a picture with me. They knew what was going on with the festival and the competition. In general, just having my friends and family there with me was great. They had a spot in the crowd right in front of me for the competition so I got to see them and see their reactions and things. And being on the parade float and getting to wave to them as we went by was a cool experience. The whole weekend was really great and I'm looking forward to going back again this year and enjoying it but being a little more relaxed this time. One part in particular that was interesting to me was right before the competition. We were all just hanging out and joking and then you guys took us back and went over the rules with us. Then we went back behind the stage to get ready and watched the women compete. As they were setting up for the men's competition the joking stopped. The mood changed a lot and everybody got quiet and serious and I guess started to prepare themselves. USSA: It's definitely a high-pressure situation and everybody has to get themselves in the zone. I think you could have done everybody a favor by just telling them that you were going to go 21 minutes. That would have taken the pressure off for the other guys. Thanks for chatting with us Mike! We'll see you in September!